In a Mercedes-Benz family full of appeal, we’ve often wondered if the 2653 model is the most appealing of them all, simply because the 13 litre class has the inherent versatility to be more things to more people. Anyway, after a B-double run up the Hume, we can now stop wondering. The ‘53 is everything we thought it’d be, and then some. One month does not make a year and true, January isn’t a particularly reliable guide to how the rest of the year might pan out. 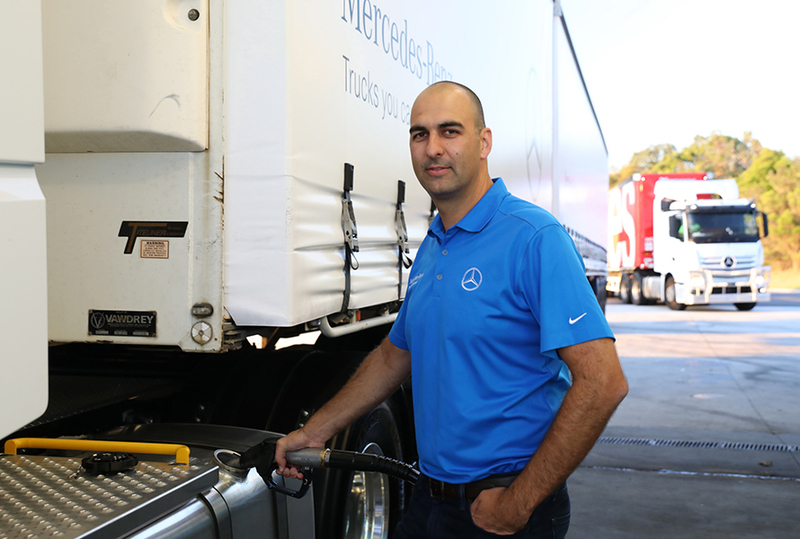 Back in early February over a quick coffee in a Gundagai road house, with January’s heavy-duty sales figures still burning bright, Mercedes-Benz Trucks senior manager Andrew Assimo wasn’t about to let the light fade on what he asserted was a significant moment in the early evolution of the new Benz range. Outside, parked among a bunch of northbound runners on the Hume, a Benz 2653 model hooked to a curtain-sided B-double set barely rated a second glance as drivers walked by, its ‘new model’ status firmly blunted by the increasing numbers now plying the road. 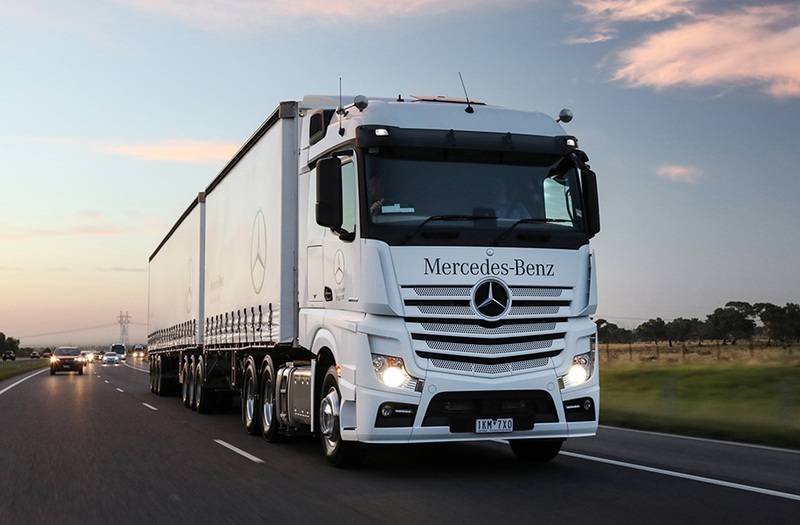 Still, Andrew Assimo was pumped, because for the first time in several decades, January’s figures confirmed his beloved Benz had achieved more than 10 percent of the heavy-duty truck market. What’s more, the only brands in front of Benz were perennial front-runner Kenworth and a consistent Isuzu happily feeding the market’s seemingly insatiable appetite for its six-wheeler and eight-wheeler rigids. For the aspirational Assimo, the new model’s ascension to third slot was a huge leap, something to be savoured and perhaps even noted as that point where ambition and reality first came together. The icing on the cake, however, was the relegation of arch rival Volvo to fourth rung on the ladder, albeit by just four trucks. "Yes, we’re targeting Volvo, absolutely," Andrew said abruptly. "They’re currently number one and that’s where we want to be. "It’s early days and the year still has a long way to run, but we know how good our truck is and to aim for anything less than number one would be an injustice to our belief in this product." Early days indeed! A month later in early March, sales states for the first two months of 2018 showed Mercedes-Benz slipping to 8.5 percent of the heavy-duty category, sharing fourth spot with Mack. Kenworth had also fallen a tad but was still at the top by a hefty margin. Isuzu on the other hand had fractionally increased its stake to maintain second spot, while snapping into third was …. you guessed it, Volvo. Cynics might see Benz’s slide as a step back to market reality but for the most part, it would be a false view because before the arrival of its new model range, Mercedes-Benz struggled to reach annual figures above three per cent. So, taken in a growth context, a figure of 8.5 per cent for the first two months of what is shaping to be another boom year for truck sales is a vast improvement on the brand’s performances over the last decade and more. It’s hard to know, but maybe Andrew Assimo was actually expecting a drop after January’s jump up the ladder. Whatever, as the conversation continued in Gundagai it was patently apparent that nothing was being taken for granted, and nothing would deter the commitment to reach the top. "We’re not naive and we know our goals are ambitious," he said with stoic certainly. "We also know the task is massive and it won’t happen overnight, but we aim high because the people and the product deserve nothing less. "Number one is the aim, definitely! It’s the motivation for everything we do." 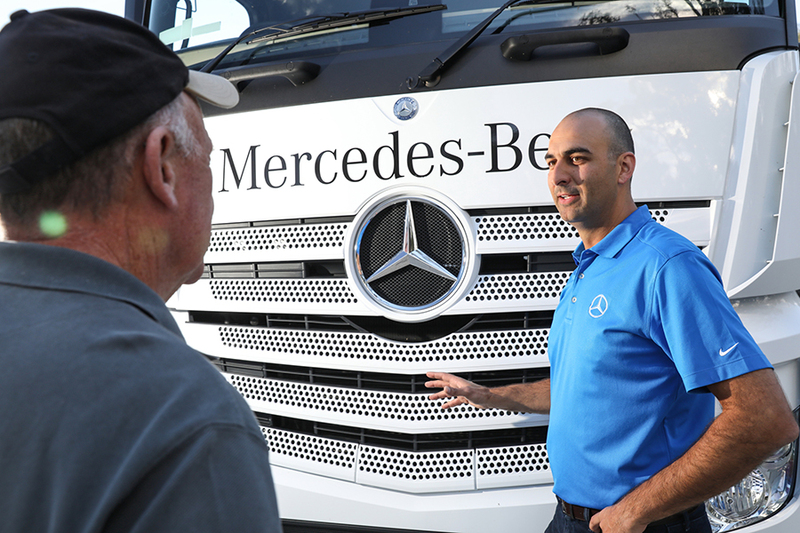 Benz to the bone: Mercedes-Benz Trucks senior manager Andrew Assimo. Top of the continental cab-over class is the ultimate goal. His passion is indisputable, even profound. It is also completely understandable, because like so many others in the Benz bunker, Andrew Assimo has devoted the last five years and more to ensuring this new breed of Mercedes-Benz trucks would not just bury the burdens of the previous Actros family, but build an entirely new history for the Benz brand in this part of the world. Right now, the new range appears to be doing many things extraordinarily well, with an emphatic Assimo citing a wealth of European experience followed by several years of intensive Australian testing, detailed operator feedback, and perhaps most significantly, the willingness of German principals to listen and react to Australian requirements, as the bedrock of the brand’s march to such strong early prominence. "We know we’re on the right path," Andrew continues. "It’s 18 months since the first of the new trucks went on the market and seriously, our confidence comes from not just the results of the testing we did, and still do, but the exceptional customer feedback we keep getting on performance, fuel efficiency and reliability. "There have been very few teething issues and all the early planning, all the work done on making sure the service network is up to scratch, it’s all paying off. "Given the problems of the past, we weren’t prepared to take any chances with the future. This is a new era for Mercedes-Benz and we won’t be satisfied running second. Not to anyone." It is an equally determined Andrew Assimo who, despite the demands of a fiercely competitive market, refutes any suggestion that price will be the dominant factor in Benz’s push to the top. "We are positioned to be competitive, of course, but it’s the total package that will determine our future, not one specific item, be it price or anything else," he emphasised. "Obviously you need a good truck to start with, but more and more truck operators are looking at the total package and what that contains. "Safety, for instance, is playing a bigger part in buying decisions than ever before and the safety credentials of Mercedes-Benz are second to none," he affirmed, detailing a vast suite of advanced features as standard equipment in the new range. 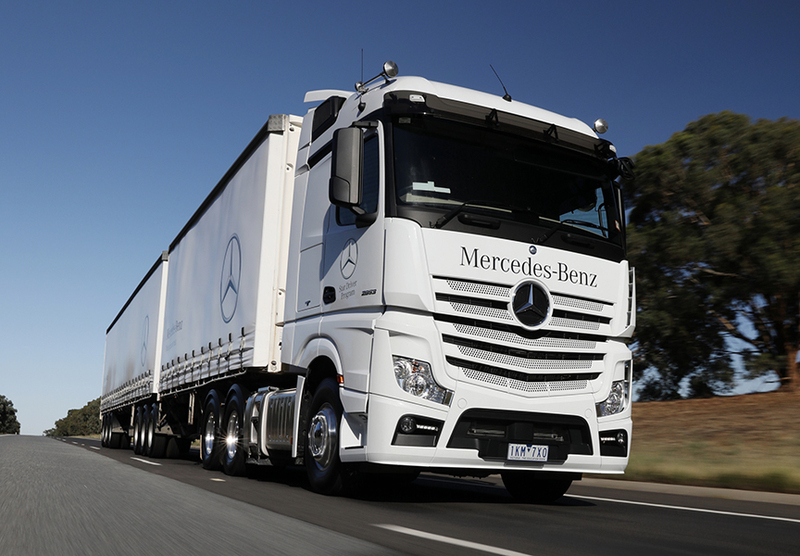 Even so, Andrew was eager to add that safety, vital as it is in the modern arena, is essentially one strand of a three-tiered ‘Road Efficiency’ package aimed at lowering costs and keeping trucks on the road longer through reduced downtime. In its current form, the package includes five-year/500,000 km complimentary servicing for air-suspended on-highway models with a gross combination mass (GCM) up to 90 tonnes, comprehensive long-term service plans, a guaranteed ‘future value’ (buy-back) initiative, a ‘Star Driver’ training program offered with every vehicle delivered, and an on-board Mercedes-Benz telematics system. "We know our truck is right and that’s why we can back it all the way," Andrew attests. "Like I said, we don’t intend to run second to anyone, in anything." Well mannered: Ride, steering and overall road handling are second to none. Meantime, rejoining the Hume, the 2653 was soon hauling its 59 tonnes mass comfortably up to speed and for me, simply reinforcing the reasons why the two models – 2651 and 2653 – powered by the 12.8 litre OM471 engine are already the biggest sellers in the new Benz family. Sure, previous drives in 11 litre and 16 litre models (they’re actually 10.7 and 15.6 litres respectively) showcased their respective abilities to satisfy a wide range of roles. For instance, in the lead-up to the official launch of the new range towards the close of 2016, I’d driven a 16 litre 2658 as a full-weight B-double on two separate occasions – Sydney to Brisbane and Adelaide to Alice Springs – and each time came away convinced that at either 580 hp or 630 hp, the big bore models would not only cope easily in roles up to their standard 90 tonnes GCM rating, but also deliver respectable fuel efficiency despite the engine’s copious displacement. Likewise, in an extensive drive through Melbourne’s outer regions some months later, the 11 litre 2643 showed what an agile, responsive and frugal contender it is for workloads up to 45 tonnes. 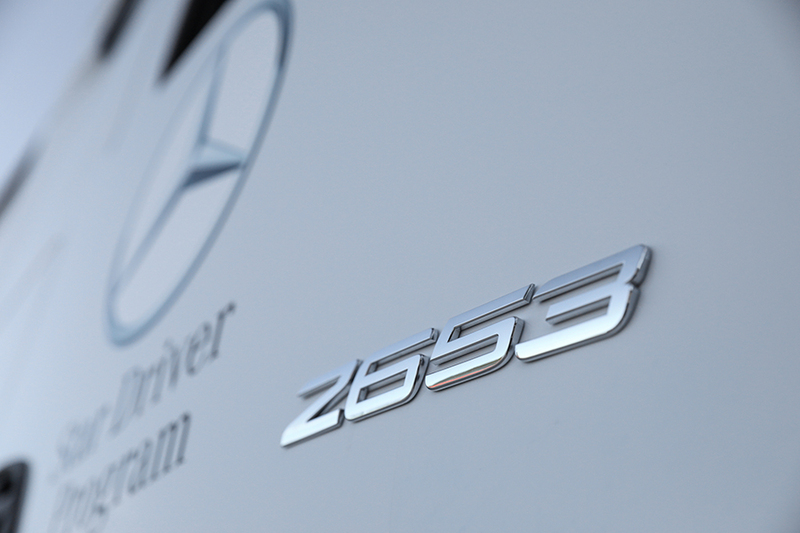 Its bigger brother is the 2646, rated for roles up to 62.5 tonnes which obviously signals Benz’s belief that this 455 hp version of the lively 11 litre will also handle shorthaul B-double work. However, it is engines around the 13 litre displacement which continue to capture the bulk of the business for not only Mercedes-Benz but also its major rivals, not least Volvo with its popular D13 engine and increasingly, Kenworth and DAF models punched by the Paccar MX engine. Simply put, modern engines around 12 to 13 litres have evolved to provide the performance and efficiency standards capable of straddling a vast range of roles from linehaul and regional B-doubles to single trailer work and truck and dog duties in both standard and PBS form. They are, in effect, the multi-talented tradesmen of the heavy-duty class. It’s an opinion cautiously conceded by Andrew Assimo, careful not to pump up the prospects of the 13 litre pair at the expense of its bigger and smaller siblings. There has, he says, been strong acceptance across the range but there’s no denying the two 13 litre models are collectively achieving the strongest sales, a fact highlighted perhaps by how long it took to make a test truck available for this exercise. "Initial demand took us a little by surprise but that’s not an issue now," he remarks. "We’d done a lot of work making the market aware of the new range and interest was strong right from the start. "Maybe we underestimated the level of early demand a little but even so, I don’t think we could’ve asked for a better start. The momentum has just built from there." Yet despite the 70 tonnes GCM rating applied to both 13 litre models, Mercedes-Benz appears to be largely offering the 2651 as a higher powered alternative to the 11 litre 2643 and 2646 models for single trailer, truck and dog, and some shorthaul B-double applications. Like its 11 litre siblings, the ’51 comes with a 2.3 metre wide cab in slimline or sleeper form, dispensing peak outputs of 375 kW (510 hp) at 1600 rpm and top torque of 2500 Nm (1844 lb ft) between 1100 and 1400 rpm, with Mercedes-Benz also listing a strong 400 kW of engine braking power from the 12.8 litre engine. The 2653, however, is primed to play in a bigger league; a league where linehaul B-doubles and PBS truck and dog combinations are more the norm. It’s also a league where the Euro 6 engine’s peak outputs of 390 kW (530 hp) at 1600 rpm and a gritty 2600 Nm (1918 lb ft) of torque between 1100 and 1400 rpm go head-to-head with Volvo’s D13 in the battle to provide an optimum balance between potent performance and respectable fuel economy. What’s more, it’s a battle involving highly advanced 12-speed automated shifters which in the case of the 2653, sees the engine coupled through a dual plate clutch to a direct-drive version of Daimler’s latest 12-speed PowerShift transmission. Putting performance to the pavement is a hypoid drive tandem running a 2.733:1 diff ratio, mounted on airbag suspension. As Andrew Assimo was keen to emphasise, from front to back it’s an all-Daimler powertrain and driveline. 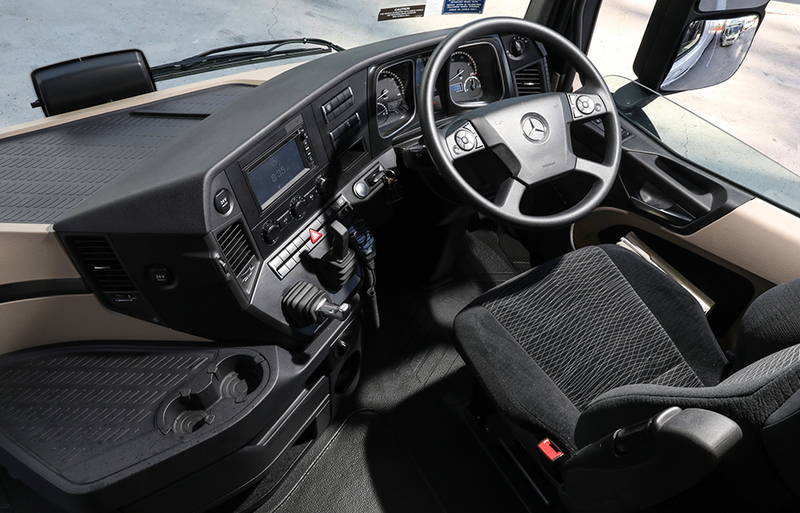 Like all models in the new Benz range, 2653 cab layout is comfortable and entirely functional. There’s also a narrower and lower version. What’s more, the ’53 also comes in two cab types. There’s the lower profile 2.3 metre wide L-ClassicSpace sleeper with the engine tunnel protruding 170 mm into the cab while higher up the scale, literally and physically, is the tall 2.5 metre wide L-StreamSpace sleeper cab with a completely flat floor. At this point it’s worth reiterating the opinion that after spending the night in the premium StreamSpace cab on previous drives, it remains the biggest and best bunk of all European cab-overs. According to Andrew Assimo, the benefit of offering two cab types has already been verified with most linehaul runners opting for the bigger cab whereas a number of fleets engaged in regional B-double work have opted for the lower, narrower version. For this exercise though, the hope was for another stint in the top-shelf StreamSpace cab and gratefully, Mercedes-Benz was happy to supply, eventually. 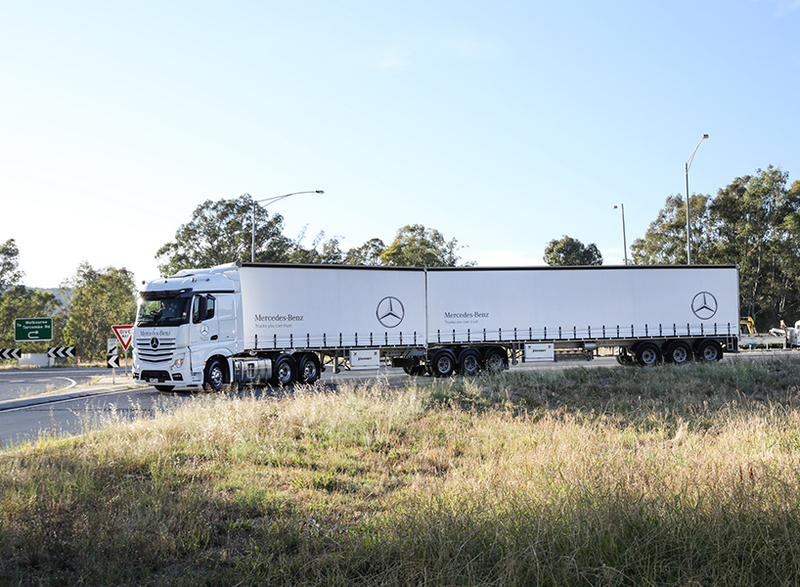 This truck had, in fact, been doing demonstration duties for some time as part of Mercedes-Benz’s ‘Star Driver’ training program, acquiring almost 17,500 km by the time we pulled into early morning traffic outside Daimler Trucks’ Somerton branch in Melbourne’s northern suburbs. Notable by its absence, however, was an Actros badge. A wise move given the desire to bury the past and create a new era for the Benz brand in this part of the world. Anyway, as we’ve pointed out before, cab-overs don’t come much taller than the flagship StreamSpace cab but it’s at least an easy climb on broad non-slip steps and well-positioned grab handles. Still, make no mistake, it’s a lofty trip. It could be argued, of course, that such a high perch at least provides a good view. True, except mirror placement across the new Benz range substantially impedes the driver’s right side vision on the approach to roundabouts. As we’ve commented before, either a redesigned or repositioned mirror assembly would be a welcome improvement to a range where safety is such a fundamental value. That said, settling into the driver’s chair with Andrew Assimo filling the shotgun seat, it took just a few minutes to find a good driving position and become reacquainted with the main control functions. Like its continental counterparts, the new Benz range is awash with technical features designed to enhance safety, maximise driving ease and streamline overall efficiency. Consequently, familiarity takes time. However, as this interstate stint in the 2658 reaffirmed, operation of the various systems in the new Benz range is arguably the most logical and easily understood of all trucks in this class. It’s an important point. For drivers, particularly in fleets and most notably those whose acceptance and comprehension of current technologies doesn’t come quite as readily as others, function and logic are at their best when easily understood. And when it comes to the detailed technological features of a modern, premium truck, there’s no better way to create understanding and appreciation than a complimentary driver training program as part of every new truck’s handover. The premium StreamSpace cab is a tall climb but offers the best sleeper of all Europeans. ‘Star Driver’ training program is a smart initiative for easing driver concerns about modern technology. Half an hour north of Somerton on an uncluttered freeway, the 2653 settled easily into its work, notching 100 km/h with the rev counter sitting a twitch under 1450 rpm. Just like the models I’d driven before, there was plenty to like. Ride quality, steering and overall road manners all rated well from the outset and as flat running gave way to undulations on the stretch to Seymour, it was quickly apparent that brisk throttle response and the dour determination of an engine with more than 1900 lb ft of torque on tap would be strong traits. Typically, they would be traits exemplified by the slick, almost imperceptible shifts of an automated transmission at the height of its evolution, responding with absolute precision to engine and driveline demands. That’s not to suggest the seamless synergy of Mercedes-Benz’s engine and transmission combination is any greater than most of its continental competitors. It does, however, signify the remarkable advances in engine and driveline technology achieved by Europe’s top brands in recent years and equally, that the Benz combination is up there with the best in the business. With rare exception, the transmission was left in auto mode for most of the day and indulging a personal preference, cruise control was largely limited to the longer stretches of reasonably flat road. Northbound is the harder haul on the Hume and the first of the big pulls is Aeroplane where the ’53 gritted its teeth from peak power at 1600 rpm down to top torque at 1100 rpm before making each shift. Seamless is again the word that best describes an effort which on the sharp hump near the top saw the combination drop back to 30 km/h in 7th gear at a touch over 1500 rpm. Later, Wagga Hill was an almost identical performance while on downhill runs, the retardation of the multi-stage retarder and its assimilation with pre-set speed control was both effective and effortless. On a road like the Hume, driving a heavy truck just doesn’t come any easier. There’s probably not much left to say other than recount previous impressions citing a comfortable and entirely practical cab layout. In short, the 2653 is what I thought it would be, a highly effective and undeniably impressive linehaul prime mover with the inherent systems and features to bring it into close commercial contest with any contender in the same class. At the end of 830 km, the truck’s on-board computer revealed an impressive fuel figure of 1.9 km/litre, or 5.37 mpg. Of course, AdBlue consumption must be taken into account but given Mercedes-Benz’s claim that AdBlue represents just three to four percent of diesel consumption, its impact on the overall efficiency of the 13 litre Benz is no worse than fractional. Customer feedback on reliability, performance and fuel efficiency are driving sales across the board, says Andrew Assimo. The smile on Andrew Assimo’s face as the truck was parked at Daimler’s Huntingwood facility in Sydney’s west left no doubt of his satisfaction with the effort of a model which competes in arguably the most formidable section of Australia’s linehaul business. Sure, some operators and drivers will want the greater grunt and potentially longer lifespan of the bigger bore 16 litre models over their 13 litre siblings, and that’d be fair enough. After all, as an old and wise friend would often remark, "It’s hard to kill cubes." However, our estimation is that with its 2653 in particular, Mercedes-Benz has for the first time in a very long time, a centrepiece model which can not only go head-to-head with the best in the continental cab-over class, but genuinely stake a claim as the best of the bunch in a brutally competitive field. Whether Mercedes-Benz ultimately reaches the top of the tree among European cab-overs remains to be seen. The certainty, however, is that the 2653 won’t hurt its chances. Not one bit!